Have you ever attempted to look at someone, only to find that they are looking at you? 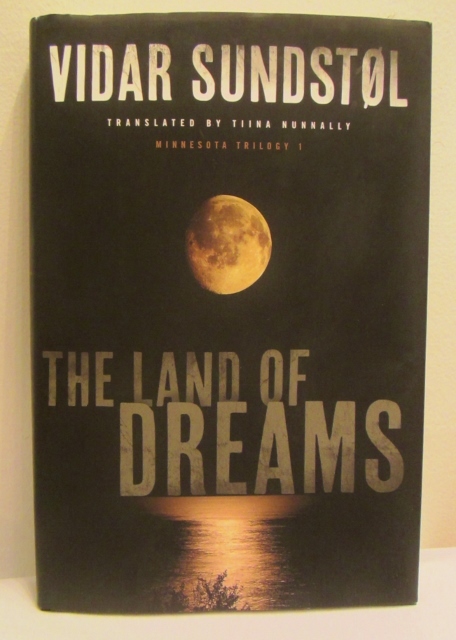 This is the experience I had with Vidar Sundstøl’s novel, The Land of Dreams. Winner of the Riverton Prize for best Norwegian crime novel, it is the first part of a trilogy about Americans of Norwegian heritage in Minnesota. Sundstøl spent a few years in Minnesota soaking up the natural scenery, local customs and regional history, then published his novel about Minnesotans for his Norwegian audience. Now it has boomeranged back in translation and I find myself reading about an underexplored element of my own country’s past from a unique Scandinavian perspective. The story begins with a U.S. Forest Service officer stumbling upon the first murder in the region since 1874, and finding a possible connection between the two crimes. Sundstøl’s moderately paced, meditative prose maneuvers easily between a grisly crime scene, a family myth about immigrant resolve (that may be more of a lie), and a slew of locals with dreams in various states of disarray. It’s a good, straightforward crime-fiction narrative. But this novel is special for the way the murder investigation is deliberately refracted through its unique multi-cultural lens. Officer Lance Hansen is Norwegian-American but because the victim is a Norwegian national, a Norwegian detective flies in to help with the case, and he soon becomes suspicious of Hansen. The narrative point of view switches between the two men and together, these characters raise the question of what it actually means to be Norwegian-American (or Norwegian…or American!). While the Americans seem fiercely proud of their connection to Norway, the Norwegian seems somewhat alienated. As the investigation progresses, Sundstøl stretches cultural boundaries further, introducing a French ancestor, the Native Americans (Ojibwe) who worked and traded with settlers (and whose mistreatment is carefully broached), and Hansen’s ex-wife and son, both of mixed Norwegian and Ojibwe heritage. Throughout, Sundstøl weaves a colorful supporting cast and quaint local lore into the narrative. This can at times feel stiff and unpersuasive, but it also offers American readers an interesting view of ourselves through the eyes of an outsider. During his stay in the US, Sundstøl seems to have been amused by minor oddities that most Americans would barely register. For instance, everyone in the novel is descended from Vikings (and they refer without irony to “the old country”), but perhaps more importantly, they wear Minnesota Vikings logos. Are we in America? Norway? Or neither? This is precisely the kind of subtle disorientation Sundstøl intended. I would almost like to see more cultural dissonance and quite a lot more history, but it is a slower paced novel as it is, and most crime fiction fans will be more than satisfied. Land of Dreams is smoothly plotted and seamlessly translated (if slightly marred by slack dialogue). The pensive characters are drawn with psychological acuity and Sundstøl deftly situates us in geographic space with fluid descriptions of waterfront areas, forests, and fascinating geological and climatic phenomena. In the time Sundstøl devotes to the landscape and its history, or to the landscape’s effect on characters, he has much in common with Sweden’s Johan Theorin. That said, Theorin’s Echoes from the Dead splices together duel narratives from different periods with somewhat greater suspense. *My rating will be 3 stars (“liked it”) on Goodreads (where I just started rating books) because half stars are not allowed there. Catch me also in the coming months at the Chicago Book Review! Thats an interesting topic for a book shame you don’t feel they have made the best of it.